I’m so excited about the new Iris Apfel documentary by the late, great Albert Maysles. As well as Iris, the film features Carl Apfel, Billy Apfel, Alexis, Bittar, Mickey Boardman, Linda Fargo, Tavi Gevinson, David Hoey, Naeem Khan, Harold Koda, Jenna Lyons, Duro Olowu, Margaret Russell, Dries Van Noten, and Bruce Weber. More details about the production here. More than a fashion film, the documentary is a story about creativity and how, even in Iris’ dotage, a soaring free spirit continues to inspire. IRIS portrays a singular woman whose enthusiasm for fashion, art and people are life’s sustenance and reminds us that dressing, and indeed life, is nothing but an experiment. Despite the abundance of glamour in her current life, she continues to embrace the values and work ethic established during a middle-class Queens upbringing during the Great Depression. Read lots more about it via Style.com and Vanity Fair. 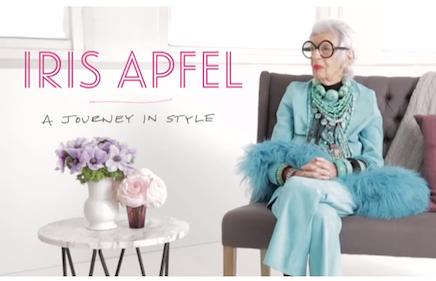 Or check out these other Iris Apfel clips and interviews via YouTube. And go shopping with the Iris Apfel HSN fashion collection. This entry was posted in Uncategorized and tagged Albert Maysles, documentary, fashion in film, iris apfel, over fifty and fabulous.